Both Facebook and Lenovo have come out with their all-in-one integrated VR headsets. Let's check out the difference between the two of them. One of the problems that hampers the mass accessibility of Virtual Reality is the lack of convenience in using high-end VR headsets. By convenience, we mean several things such as the ease of use, the non-tethered portability, the ability to access a huge library of content and media, good acceptable quality and performance and overall usability and comfortability among other things. It's like when you want to have a cup of hot/warm delicious coffee that gives you a relaxing sensation and the needed punch to get you going and all you have to do is tear open a 3-in-1 pack, pour the contents in your cup, fill it up and your ready to go! Well, that kind of VR. So, as we see VR continually developing as the years go by, the push seems to be heading towards the miniaturization or portability of VR equipment like a headset with the mobile flexibility of a Google Cardboard and the immersive VR quality of the HTC Vive. An all in one HMD that can practically stand on it's own and offer the convenience of simply putting it on with minimal or no hassle and whisk oneself to the OASIS like Wade does. Currently, there are two portable headsets that have been developed that are heading towards this particular direction in providing an all-in-one convenience for the mass usage of VR without the need for a lot of technical know how and fidgeting with the device to get the most out of the VR experience. These are the Lenovo Mirage Solo and the Oculus Go. Both these units are integrated and portable, you simply smack it on your face, turn it on and visit whatever virtual realm you choose to go to. However, there are some differences between them that can make one or the other better in a particular regard or feature. Let's start with the price. The Lenovo Mirage is a little bit expensive. It cost around 400 USD which is a price that would make you think if you'd rather get a PSVR or an Oculus Rift! The Oculus Go is only around 200 USD or maybe 250 for extended storage which compared to the high-enders looks a way lot affordable. Since the Lenovo Mirage has the higher price, naturally the hardware is more powerful than the Oculus Go. The Lenovo uses the Qualcomm Snapdragon 835 chipset with 4GB of RAM and 64GB of storage. For audio, it comes with a headphone jack, a dual microphone and a 2,560 x 1,440 LCD display screen. Battery life is tagged at seven hours. The Oculus Go uses the the weaker Qualcomm Snapdragon 821 which is said to be around 27% slower then the 835. The 821 also consumes 40% more energy so the Oculus Go will have a shorter battery time than the Lenovo Mirage. The video display is the same 2,560 x 1,440 LCD but Oculus has redesigned the optics on the Go giving a much better quality in terms of video. Tracking is another thing, The Lenovo Mirage uses 6DoF tracking called WorldSense which came from Google's Daydream VR platform. This let's you move around your virtual environment with ducking, dodging or leaning. The Mirage does not use external sensors to do these and has a tracking area of around 5 feet or 150cm. 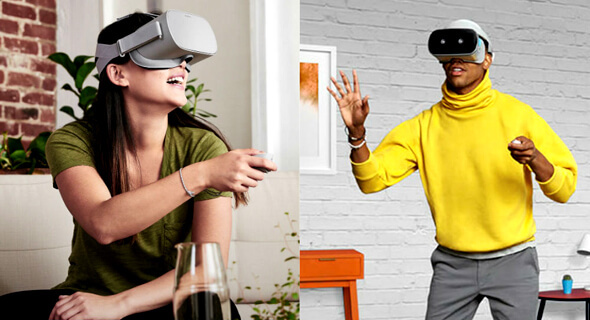 Compared to this, the Oculus Go only uses 3DoF tracking where the headset tracks the rotation of your head from left to right and up or down similar to some Smart phone based mobile headsets. One caveat though with the Mirage is that developers still have to develop apps for it that will take advantage of its 6DoF tracking capabilities. When it comes to optional add-ons, the Lenovo Mirage Solo can make use of a VR camera that records 180x180 degree videos though this will cost around an extra 300 USD. Optional memory expansion comes in the form of SD cards while the Oculus Go will be using micro USB storage drives instead. Both the headsets use a 3DoF controller hand held device that acts as a virtual pointer. Finally, the most important is content and information accessibility. As the push is towards an all-in-one device, the VR headset should at least be able to act as an information and computing integrated, convenient high-tech gizmo stuck to your face. The Oculus Go shines in this regard. The Go will support around 1,000 available apps from the Oculus Store. What more, the Go comes with it's own web browser so you could actually surf the internet in VR. It also has access to NetFlix so you can actually watch the DareDevil or Will Robinson and his robot sidekick while laying down and looking up at the ceiling. The huge availability of VR content and internet access makes the Go a very practical product choice. As for Facebook Space, no doubt there's going to be access it. Unfortunately, the Mirage is hampered in that it does not come with Google Chrome despite using the Daydream platform. It has access to You Tube and available apps but not the kind of content base or internet accessibility as the Go. Unless Lenovo can at least compete with Oculus in the content department, depending on it's technological superiority may not be enough to justify it's current price tag. However, time will tell if Lenovo will be able to make the Mirage Solo a practical and competitive choice in the all-in-one VR headset market. And so, there you have it folks, The Lenovo Mirage Solo and the Oculus Go. As it stands, the choice will be up to the preferences of the user should one go for the Solo intense VR experience or stick the headset to ones face and Go Go Go!